Health A-Z covers many topics about equine health and answers some of the frequently asked questions. This can be used in conjunction with the website videos to help you further understand any health issues you may wish to know more about. We will be constantly updating both the Health A - Z and the videos on the website. The first time many people in the equine world will have been aware of this would be after the retirement of Totilas, the German dressage stallion, because of bone oedema in a hind-leg. “Bone oedema” is also known as “bone bruising” or sub-chondral bone disease. It is a relatively recently diagnosed disease that has been found because of the increased frequency of MRI examinations in horses and has many implications for their athletic performance. The sub-chondral bone lies beneath the softer joint cartilage and harder calcified cartilage that comprises the joint. It provides “scaffolding” for the joints and is made up of harder bone near the joint and softer bone near the marrow cavity. In this position, it is particularly prone to stresses that re transferred through the joint and bone; if it doesn’t adapt to these stresses, particularly repetitive stresses, bone oedema or sub-chondral bone disease can occur. On MRI sub-chondral bone disease can be seen as an increase in the fluid signal particularly on T2 and STIR scans that indicate a change in the metabolism and structure of this area of sub-chondral bone near the ends of long bones and next to joints. It is not visible on X-rays initially although eventually denser or thinner bone may be visualised. Bone oedema is usually associated with lameness although the severity can vary from a mild to severe. However, the most serious implication can be that it is an early stage of stress fractures. 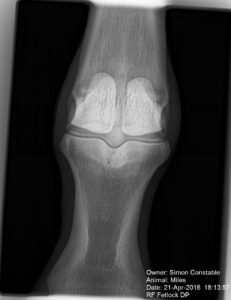 Previous to the advent of MRI scanners in horses, these injuries often remained undiagnosed until follow-up X-rays, often several months later, would show areas of sclerosis (denser bone appearing whiter) or bone lysis (weaker/thinner bone appearing darker). This delay in diagnosis could potentially be fatal because of the risk of fracture. Although this risk is particularly high in elite athletes such as racehorses, I regard all horses as athletes to a greater or lesser extent and, therefore, any horse could potentially fracture a bone. It is interesting that in human orthopaedics, where MRI is part of a routine evaluation, bone oedema is also a common precursor to injuries in athletes too; a good example is in cruciate ligament injuries of the knee. Bone oedema is caused by repetitive trauma to bone that may be more sudden and severe or a lower grade, repetitive trauma where the bone doesn’t have opportunity to adapt to these forces. There are several circumstances that may cause this but the most likely are high intensity training leading to trauma on hard ground and/or irregular training that doesn’t allow adaptation of the bone. The condition of sub-chondral bone disease is still not fully understood and many factors may affect speed of recovery. The aims of treatment are to restore the original bone function and metabolism as well as preventing further progression and ultimately fracture. Rest may be used initially to reduce the inflammation within the bone although prolonged rest may delay bone healing. Change in the frequency, duration and intensity of exercise as well as reducing concussion with swimming can be used to reduce the impact on the sub-chondral bone and therefore promote healing. This time to healing is generally a minimum period of several weeks but may be many months. Aspirin can be used to increase blood supply to these areas of bone damage although its effectiveness is not fully known. The use of internal fixation using screws to stabilise the area has a dual purpose of preventing fracture and allowing blood vessels to regrow to effect and speed up repair. It may be used following the failure of a prolonged restricted exercise regimen or as a first line treatment. Care must be taken when exercise on hard ground; this includes cantering, galloping or even sharp turns. Modern equestrian surfaces and racecourses are generally better than un-watered turf such as at some show-grounds. Regular exercise on different surfaces allows adaptation of the bone and other structures such as soft tissues- tendons and ligaments; this is important because fatigue can be a big contributory factor to injuries. 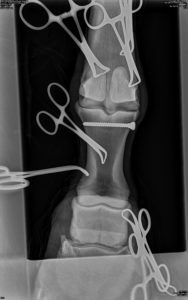 Although “equine bone oedema” must have been around for a long time, previously undiagnosed, in lame horses, it is now becoming more and more common. Future treatments and exercise regimens need to be developed, evaluated and put into practice to prevent the loss to our sport!